Discussion in 'Mayberry Lounge' started by Michaelangelo, May 21, 2014. Battersea Dogs and Cats Home has warned that an app allowing people to find a new pet based entirely on looks risks reducing animals to disposable items. PetMatch runs image-recognition technology to match pictures of animals, selected by prospective owners, to an "adoption database". 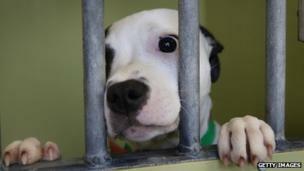 It has been suggested the app can help owners find replacements for dead pets. I find it a bit creepy. Cant see myself going out and getting a look a like pet to replace the one that I have had for years. I'm sure it can console some though. Reminds me of Re-Pet from The Sixth Day. Not for pets. Make it for ex-girlfriends though, it could have saved me some hard times. Don't see a problem with this. Im not against getting a new pet. It's just trying to duplicate the one you lost that irks me. If it promotes adoption of dogs/cats in general, I don't see the issue here. that wasn't so much directed at you. some poeple have breeds they prefer. if they can rescue one instead of going to a breeder, then i think that's great. anyone who gets a dog should obviously interact with it then irl before making the final decision to adopt or not.